ConTec specializes In concrete technology, in particular in rheology of cement based materials such as cement paste, mortar and concrete. Our goal is to be leading in concrete technology. ConTec produces and sells coaxial cylinder viscometers in variable sizes or capacity testing on material sample from 300 ml to 25 liters. 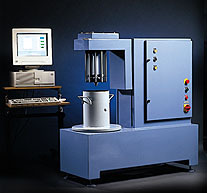 The viscometers are fully automated and computerized viscometers for fresh concrete, mortar and paste. 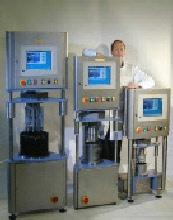 The first viscometer BML-viscometer was developed at the Norwegian Institute of Technology by Dr. Olafur Wallevik et. al. as a part of an extensive research program on fresh concrete properties during years 1982-1991. Under the supervision of Dr.Wallevik there have been developed more types of viscometers. The viscometers have been sold to several countries around the world. Dr. Olafur H. Wallevik has worked with the rheology of concrete and other cement based particle suspensions since he finished his master thesis on that theme at the Norwegian Institute of Technology in 1983. In the year 1987 he made the first version of the BML Viscometer. He received his doctor degree in rheology from the same university in 1990. His special fields are Rheology of Fresh Concrete, High Performance Concrete, High Strength Concrete, Self-Compacting Concrete and Microstructures. Dr. Wallevik is the head of the concrete division at Innovation Center Iceland and the manager of ConTec Ltd.
Dr. Wallevik Rheology course: “Rheology of Coarse Suspensions, such as Cement Paste, Mortar and Concrete”, have been hold in many different countries. The course is designed for those in industry, university, or research institution, who work with problems related to fresh concrete properties and/or other cement based particle suspensions such as cement paste, grout, repair material, mortar, for instance self leveling flooring grout.